MANILA PHILIPPINES—The biggest gathering of students, young creatives, marketing and creative heads is happening this April 25-26 at CreativeFest 2019. The two-day festival is brought to life by the vision of 4As Creative Guild of the Philippines, an organisation made up of the country’s most respected creatives in the world of advertising. With executives from the top agencies in the country like Dentsu Jayme Syfu, Publicis Jimenez Basic, BBDO Guerrero and so much more, the guild has supported Philippine creativity for years and has championed several young creatives to join international competitions to represent the country since its formation more than 30 years ago. 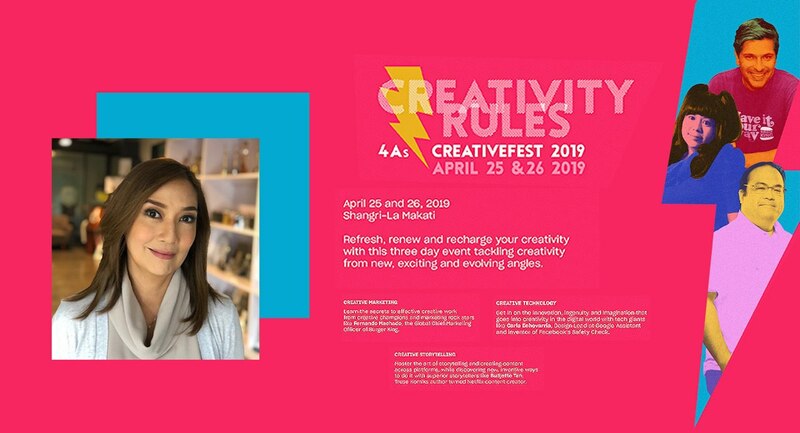 Presently headed by advertising icon Merlee Jayme, Chairmom and CEO of Dentsu Jayme Syfu, this year’s CreativeFest is set to be bigger than ever to celebrate “greatness through creativity”, as Merlee put it when we had the chance to talk to her. “Creativity touches people’s minds and hearts in the most unforgettable way, through a unique point of view, a different way of seeing things, brilliant ideas [that have] never been done before. We’ve dedicated this event to Creativity because it is the one thing that separates the amazing from the boring, the interesting from the usual, the real trending from the “boosted”. Whether in marketing, advertising, politics, sports, and entertainment, creativity simply rules.”, Merlee shared. On top of all the astounding work Merlee has done with “the Guild” and Dentsu Jayme Syfu, she also recently joined an all-female power jury for The Gerety Awards, set to make its mark in the advertising world mid-July. Support creativity and Filipino ingenuity with Merlee and the rest of the Creative Guild of the Philippines, this April at Makati, Shangri-la and grab your tickets here before February 28 to enjoy the early bird promo. Don’t miss out on this year’s two-day CreativeFest and prove that as always, ‘Creativity Rules’.